Children learn to create healthy eating and exercise habits in children starts at birth - and it starts with YOU! The time may finally be right to make significant strides towards full inclusion of young children with disabilities in early care & education programs. Working with young children is fun, but it is tough business. Child care professionals work from dawn to dusk — teaching, nurturing, helping build healthy habits with the children in their care. Interested in seeing how it all gets done? Healthy and active living practices recognition programs encourage child care programs to implement policies & practices. Child Care Aware® of America’s white paper, Paths to a Healthier Child Care Workforce, covers the health and wellness habits of child care workers employed in child care settings. Messaging can be an effective method of sharing information and encouraging healthy behaviors. Child Care Aware® of America has developed a healthy standards messaging toolbox for child care professionals. 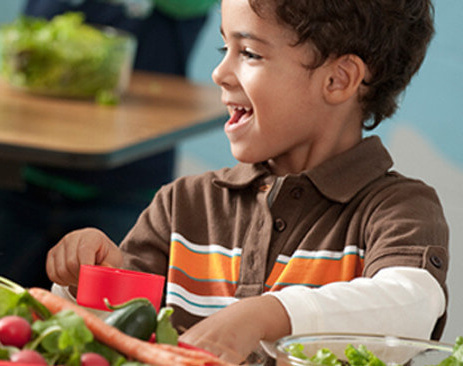 CCAoA is expanding CCDBG technical assistance activities in targeted states to emphasize health, nutrition, and obesity prevention with the Health Child Care, Healthy Communities project. Additional resources on everything from safe sleep practices to screen time and healthy food and activity. Setting examples for children early on in life can set them on the course for good health as an adult. CCAoA, in partnership with the Administration for Children and Family’s National Center for Early Childhood Health and Wellness, is launching a pilot project on health and safety in child care. Learn how to apply for this potential funding opportunity. Child Care Aware® of America partnered with the CDC and Let’s Move Child Care to recognize providers who are investing in their own health and modeling healthy habits for the children in their care. Subscribe to this monthly email from Child Care Aware® of America for information on health-related news, funding opportunities, research, and more.